When you change the date, you can also choose a new way to connect with nature. Step away from your screen and into this serene scene: You're listening to a songbird, or maybe feeling a gentle flower petal. Relish in these little moments and more with this perpetual desk calendar, which encourages you to get outside enjoy the earth underneath your feet—or the light at the end of the day. Susan LeVine pairs each activity with a lovely illustration, so when you change the date, you can also choose a new way to connect with nature. It's a simple yet thoughtful way to be grateful for the green grass, the grand night sky, and everything in between. Made of FSC-certified wood in Tampa, Florida by Wooden Shoe Designs. $5 from your purchase goes to American Forests. Artist Susan LeVine was born and raised in Chattanooga, Tennessee where her love of nature was first ignited. A passion for art led her on a journey that began with a year of study in Italy where she was immersed in the beauty of artistic expression and the romance of the Italian culture. Susan's paintings of birds and trees are probably the greatest expression of her love of nature. she feels that nature is always talking to us if we stop to listen. Susan's product designs come from a desire to uplift the spirits of others and share a sense of wonder and celebration of life. Susan now lives in Santa Barbara, California where she gets out in nature as much as possible. Step away from your screen and into this serene scene: You're listening to a songbird, or maybe feeling a gentle flower petal. 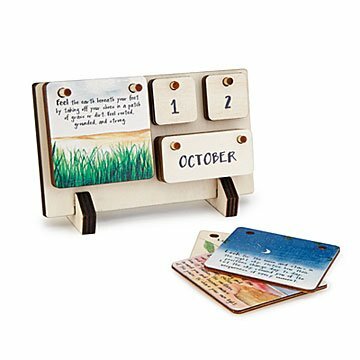 Relish in these little moments and more with this perpetual desk calendar, which encourages you to get outside enjoy the earth underneath your feet; or the light at the end of the day. Susan LeVine pairs each activity with a lovely illustration, so when you change the date, you can also choose a new way to connect with nature. It's a simple yet thoughtful way to be grateful for the green grass, the grand night sky, and everything in between. "Our mission is to bring unique and interesting products to market that are made from sustainable resources. To give back to our community and to enhance the quality of life of our employees." Wooden Shoe Designs pays employees a starting wage of $12/hr., which exceeds the area's living wage. Employees are given 7 days paid vacation time. Once they have been with the company for 2 years they receive 2 weeks paid time off. Some of their longer tenured employees receive 3 weeks off a year paid time off. Most items are made from wood. Once they are done creating a product, they take excess wood and create products from them. Once they have used as much of the wood as possible they either donate it to local schools for craft projects, or bring it to a specialized recycling facility 1 mile from their warehouse for recycling. They have special pickup two times a week for cardboard, and reuse as much of the boxes they get in to ship out product. Wooden Shoe has a relationship with Our Troops Online (Support the Troops). This is a local charity that provides care packages to men and women serving overseas. They have been working together for over 5 years in helping them create marketing materials, providing free product that they can raffle to raise money. They also give 5% of sales back to them, and on some specific products donate all proceeds. Wooden Shoe also provides free services to them, like customizing products, so they can raffle them off or sell them to raise funds. Gratitude for Nature Calendar is packed in a recycled and recyclable corrugated cardboard. There's one place—and only one place—where you'll find the Gratitude for Nature Calendar: UncommonGoods. A gift that keeps giving! This calendar can be displayed all over the house or in my office. It will be enjoyed as decoration AND inspiration! This calendar is truly beautiful!! It is filled with such sage wisdom and warmth. It is a perfect gift. I really enjoy and find comfort in the sincerity and warmth of this calendar. It is a very nice alternative to my (buzzing and pinging) electronic/iPhone calendars. The artwork and quotes make me feel happy. I also like how "tangible" it is. My kids play with it too sometimes! Taking a moment to appreciate beauty and the miracles of nature is a nice way to clear the mind of clutter and to focus on the day ahead. I like this pretty little desktop calendar with all the reminders of the stunning beauty of engaging with nature for this reason. It looks perfect in my kitchen as well but i need it more in my office. Lovely, both in concept and use! Practical, small enough for any desk or attractive for coffee table.